Spotted at ATC – Serenitea! 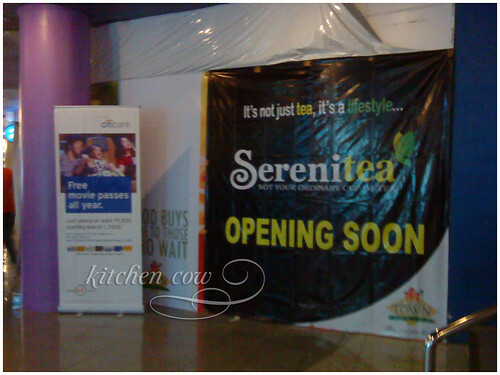 Soon to open: Serenitea! Yay! I’ve been hearing so many good things about Serenitea but haven’t had the chance to try it so I’m quite excited. This new spot will be a very welcome treat, seeing how much I love Milk Tea. For the curious, it’s sandwiched between the Smokey’s stall and Timezone—I think it’s where Oliver’s Super Sandwiches used to be. Can’t wait! For Serenitea fans reading this, what do you suggest should I try first? 9 Responses to Spotted at ATC – Serenitea! oh wow! thanks for telling us this news! i go to atc a lot, searching for a good tea place because i’m a huge tea fan–then i saw this! THANKS! Excited na ako! You said the magic word—YAKULT! Woohoo! That’s good news. I have yet to try what they offer. Been so, so curious coz a lot of my friends are addicted to this. Tried visiting their BF Pque branch but there were lots of people and had no parking space. Haha.. I.Want.To.Try! Hokkaido Milk Tea – 100% sugar – with Black Bricks (coffee jelly) is my personal favorite. I would also recommend the chicken chop and the pepper corn (fried corn cobs with the same taiwainese-seasoning, served with fried basil). —> is it obvious i’m a fan? hahaha…i love milktea, and serenitea is my favorite in manila. love their spicy tofu & corn too.